Bali Greens Surf reserves the right to resign from a lesson/trip under extraordinary circumstances. If certain conditions present danger to the participant or the service booked can not be provided due to force majors (e.g. epidemics, weather & oceanic conditions, storms, catastrophes, strikes, political unrest, war, terrorism, etc), Bali Green Surf has the right to cancel the lesson/trip with immediate effect. The service booked by the customer can be postponed or payments already made can be refunded. The customer agrees that he/she may be photographed and/or filmed during his/her lessons and the use of this material for promotion/advertising purposes, such as our website, without any prior consent. All personal data will be treated confidentially and not be transferred to any third party other than necessary to deliver the requested service. Bali Green Surf assures that the customer can terminate this agreement at any time in written form via email. The participant has to follow the instructions of the surf guides. If the customer conceals physical health issues, unfit, act irresponsibly or causes disturbances that endanger the provision of the service or the health of other participants or the company, its reputation and its employees, the customer can be excluded from the lesson. In that case, the lessons are terminated without further notice and payments are not refunded. 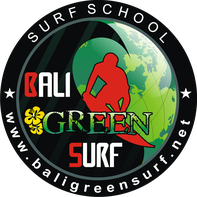 When booking surf lessons or surf trips by Bali Green Surf, the participant confirms to be physically fit and has no type of diseases, injury or condition that may endanger his/her life or be affected by surf activities. In addition, to participate, competent swimming skills & physical fitness are required. Please be aware about this, since your health is not a game! Please check your travel insurance and be aware that surfing can be a dangerous sport. All responsibility will be taken by the participants and no liability or negligence legal action may be taken against Bali Green Surf or its employees for any injury, accident or unforeseen circumstance. Therefore, Bali Green Surf strongly recommends their participants to take full travel insurance against illness, injury, accident, death, loss/damage of personal/company items, theft, cancellation and other travel eventualities, when visiting Bali. Payment has to be made either in cash at the time of the activity, in all currencies with the actual exchange rate, or via PayPal in advanced. Bali Green Surf does not take any responsibility for any loss or damage to personal items during your participation by any of our services or other activities during your visit to Bali. Moreover, participants will have to take responsibility for any damage cause to equipment that belongs to the company (See: Insurance).